Pull-Tight Seal, Numbered. Supplied in a bag of 100 seals. 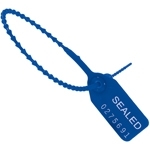 A one-piece seal made of durable polypropylene. Heat stamped with consecutive numbers. This popular product seal can be used to facilitate inventory control, recording, storage and distribution. It features a double-wall locking chamber which resembles a double dome design. The inner dome performs the actual locking while the outer dome protects against tampering attempts.